Over a hundred years ago William Morris advised “have nothing in your houses that you do not know to be useful or believe to be beautiful”. The current exhibition at the Geffrye Museum useful + beautiful: contemporary design for the home revisits Morris’ ‘golden rule’ bringing together products from a range of emerging designers and established names. Each of the products is innovative in some way, whether through its use of a new material, technology or adaptation to the way we live today. What is more, 2014 is the centenary of the former almshouses’ conversion into the Geffrye Museum, so it is fitting that the exhibition celebrates the local furniture-making trade of London, and Shoreditch in particular; one of the original aims of the museum. As Annabelle Campbell, Head of Exhibitions and Collections at the Crafts Council notes, “Good design is about innovation, it’s about elements of sustainability”. Design is also dialogue, influencing the way we live, as well as responding to it. The form and function of the objects around us influence our physical and emotional experience of a space. Climbing inside Freyja Sewell‘s felt cocoon, Hush, you have an immediate sense of retreat, even sanctuary in the midst of the museum. Our lives are so immersed in the omnipresent worldwide web, and constant connectivity of digital technology, solitude and respite are rare. Hush creates an immediate moment of calm. 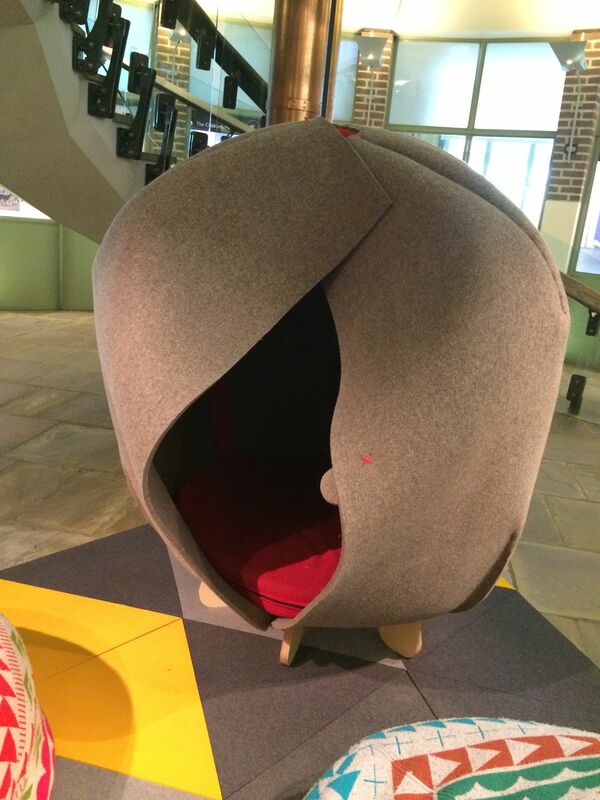 The pods are cut from a single piece of 10mm industrial wool felt and lined with padding made from recycled wool fibres, a by-product of the British carpet industry. Wool is naturally flame retardant, breathable, durable, biodegradable, and provides great acoustic insulation, hence the name, Hush. Digital technologies are providing new materials, new ways of making and marketing products. Crowdfunding sites offer designers the opportunity to leverage their fan base for financial support, for example, Hulger, the company behind designer-low energy light bulb brand, Plumen, raised the $20,000 they needed in a week on Kickstarter.com to launch their second product, 002, an energy efficient alternative to the 30W incandescent light bulb, in January 2014 (they eventually raised nearly $60,000). The original Plumen 001 is exhibited at useful+beautiful, and as part of the Design Today exhibition (pictured left) celebrating 150 years of John Lewis until August 31st. The internet enables distributed manufacturing models such as OpenDesk, a global platform that connects local makers and international designers. As the customer you can browse a range of furniture collections, download and then make the furniture yourself, or get it made on demand by a maker close to you. 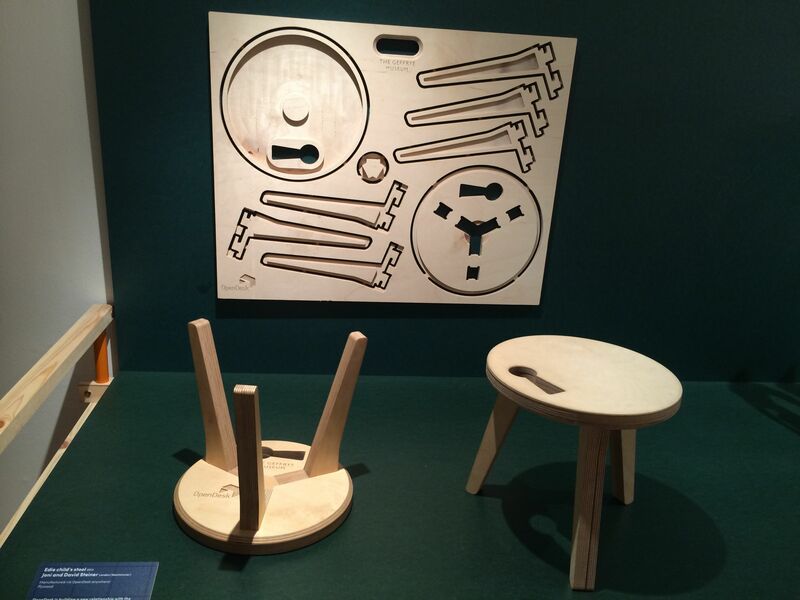 The Edie child’s stool (or bedside table) was designed by David Steiner and Joni Steiner to be made from a single piece of plywood on a CNC router with ‘air-fix’ construction. The OpenDesk platform provides an affordable route to designer products made in your community, and you can customise the finishes! Using the same technology as cardboard tubes, Seongyong Lee developed a process for making tubes from thin wood veneer. The tubes are further strengthened with a coat of laquer and used as legs for the Plytube stool. 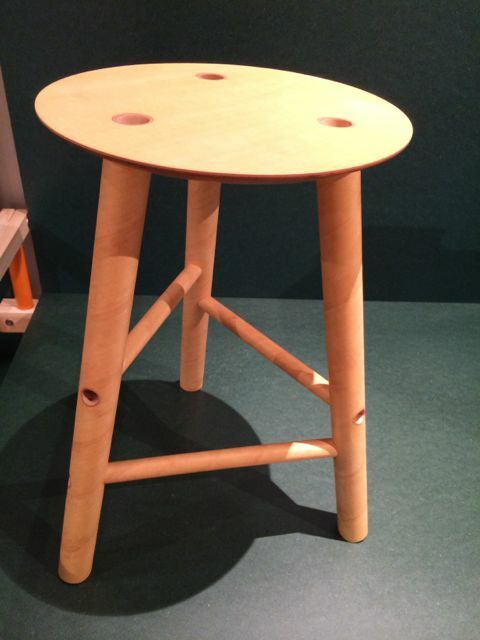 The stool weighs less than a kilo, making it more energy-efficient, and is very strong. Plytube was part of the Craft Council’s Raw Craft exhibition earlier this year. Both Plytube and William Warren‘s reinterpretation of the traditional woven-top stool reflect a renewed appreciation for traditional craftsmanship. 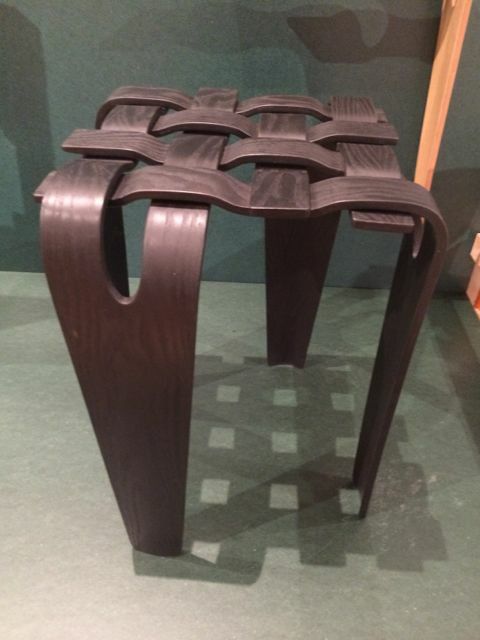 The Weave Stool is made from four identical plywood forms, with black ash veneer, that slot together. Simply elegant. Jack Smith’s Folding Stool, also made of ash, is similarly clean and considered in its design, and so versatile. The three hinged legs meet in a Y-shaped hole in the stool’s seat. Sitting down gives it strength, yet stand, pick up the handle and the stool folds flat for easy storage in our space constrained homes. 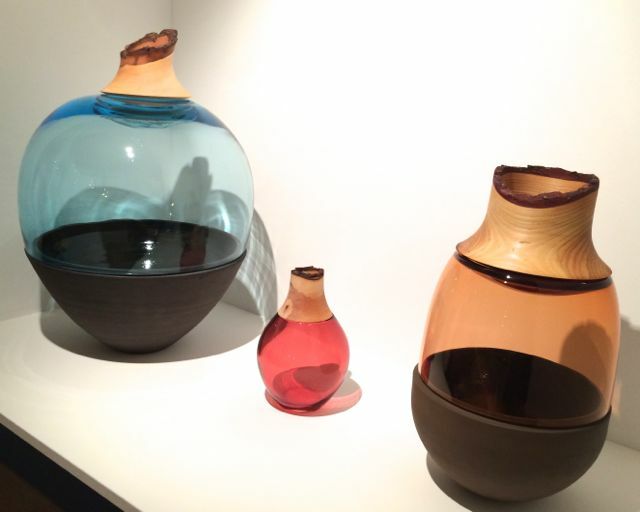 Pia Wüstenberg’s colourful, sensual and tactile vessels for Utopia & Utility illustrate Alvar Alto’s observation that “Beauty is the harmony of purpose and form”. Stacked the vessels are decorative sculptures, but each of the ceramic, glass and wooden parts is a bowl with its own use. With the aid of technology design can now be mass produced. Good design is available to everyone, along with the bad. As prices of goods have fallen, so interiors now have seasonal colours and looks that are ‘bang on trend’. The products on show at useful + beautiful have more than fleeting appeal. Many of the designs have also consider the lifecycle of the product. Piet Hein Eek‘s Scrapwood classic cupboard is made of new and found wood. Hein Eek has been experimenting with offcuts and scrap wood for more than twenty years and the range now includes a chair, table, sideboard and wastepaper basket. The Scrapwood collection is available from SCP. The Tip Ton chair, designed by Barber and Osgerby, is manufactured from a single mould, without any mechanical components. The chair is made entirely of polypropylene, so it is durable and 100% recyclable. The chair’s forward tilt position helps to keep the spine and pelvis straight, allowing better circulation to core abdominal and back muscles while at work or rest. Greater well-being certainly makes everyday living more joyful! 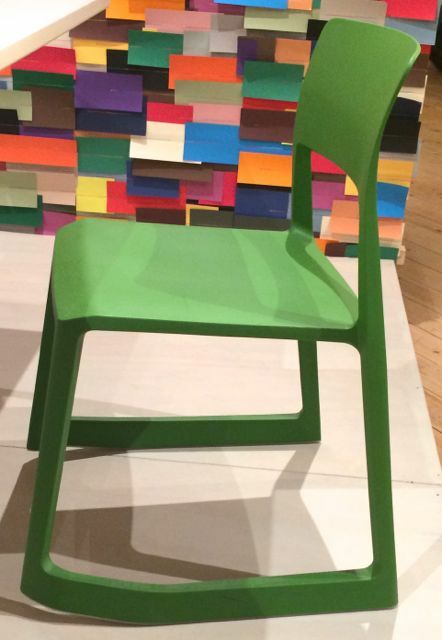 The Tip Ton chair is available from Vitra, and other stockists, in eight colours. useful + beautiful is a wonderful prompt to consider more than the aesthetic of the things we choose to live with. 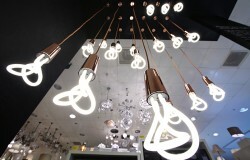 Products that have form and function are beautiful everyday! 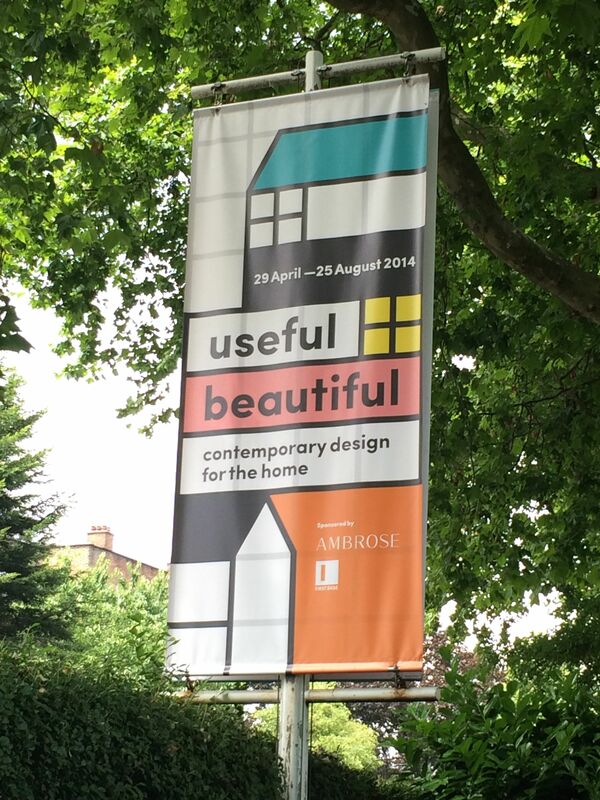 useful + beautiful: contemporary design for the home runs until 25th August 2014 at the Geffrye Museum, so see it while you still can! 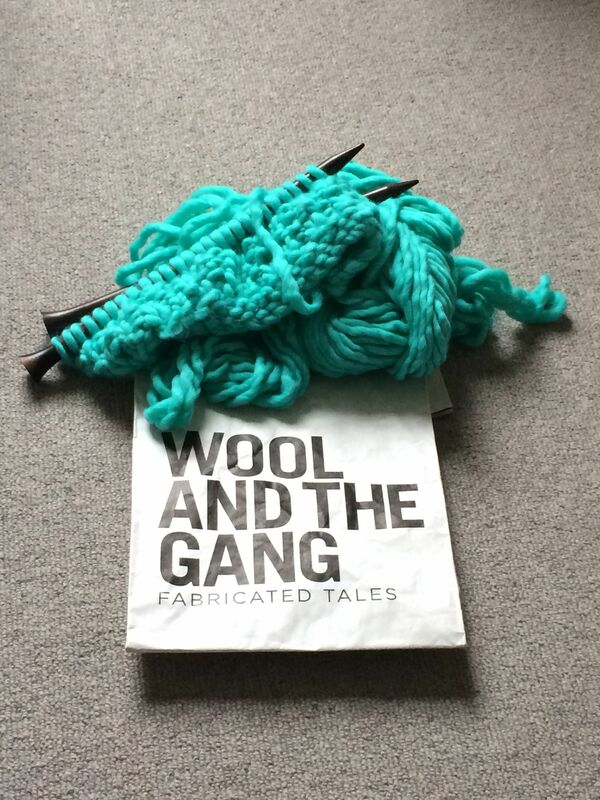 A kick start to Wool Week, with a free knitting class from Wool and the Gang in the John Lewis store in central London as part of Knit Nation. I hadn’t picked up a set of knitting needles for twenty years, not since I had knit-perled along side my grandma. However, Alexandra from WATG was undaunted by my absolute beginner status. I was swiftly given an enormous set of wooden knitting needles and chosen a peppermint green ball of chunky wool. Slip knot in place, cast on came out of the recesses of my mind, knit I could remember, and purl I was gently reminded of, and before I knew it I had my first row of ribbed stitches under my belt. The giant needles gave me a sense of being Lilliputian, as did the sense of wonder at the evident skill on the sofas around me. It was beyond my skill level to talk and knit simultaneously, but there were other novices to join me in my meditative state, and the industry was infectious, creating an immediate sense of community. after only an hour the hat was already starting to materialise. Others in the groups attend or run regular knitting groups, and it is easy to see how quickly you can get to a level where you could maintain a good chat and knit in the company of friends. It might be a while before I have knitted a pouf or cushion but I’m on my way. The UK Handknitting Association has all sorts of information from free patterns to tips on learning to knit or knitting groups in your area.